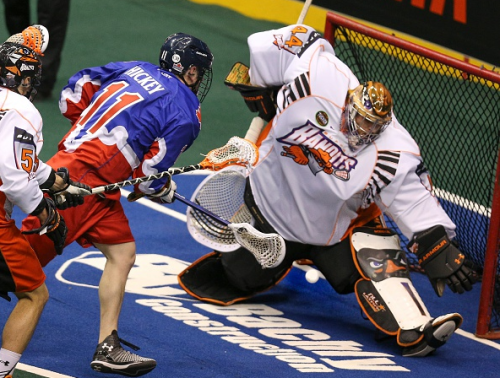 The Toronto Rock (13-4) recorded a franchise best 13th regular season win, defeated the New England Black Wolves (4-10) by a score of 15-12 on Friday night at Air Canada Centre. Last week’s hero Brett Hickey opened the scoring for the Rock on the power play 3:30 into the first quarter. New England scored a pair of even strength goals, to take a 2-1 lead. However, it was short lived as Toronto’s special teams took over. Brock Sorensen scored shorthanded and moments later Hickey followed that up with another man-down tally to give the Rock a 3-2 lead at the end of one quarter. Toronto’s Josh Sanderson extended the Rock lead to 4-2 in the early going of the second quarter. The Black Wolves rallied to tie the score 4-4 with goals from Pat Saunders and Kyle Buchanan just 43 seconds apart. Toronto struck for their third shorthanded goal of the night when Brodie Merrill went in all alone on New England netminder Evan Kirk and buried the go-ahead goal, giving the Rock a 5-4 lead at the half. New England tied the game 2:41 into the second half but the Rock rattled off 4 straight goals to lead 9-5 with just over 5 minutes left in the quarter. New England scored a couple, but the Rock’s Kevin Ross capped off the third quarter scoring with his second to give the Rock a 10-7 lead heading to the final 15 minutes. A wild fourth quarter saw both teams score five teams each. The Black Wolves did get to within two goals at 13-11, but Sandy Chapman quickly gave the Rock back their three-goal lead, scoring 9 seconds after the Black Wolves’ narrowed the gap. Rock goal scorers were Hickey (3), Kevin Crowley (2), Kasey Beirnes (2), Ross (2), Sorensen (1), Chapman (1), Stephan Leblanc (1), Josh Sanderson (1), Damon Edwards (1), B.Merrill (1). The Rock will finish the 2015 regular season on the road at New England. Toronto will host a playoff game, the date and opponent are to be determined based on the results of the final regular season games for both the Rock and Rochester Knighthawks.